Free cooling, which is the use of naturally cool air instead of mechanical refrigeration, can dramatically reduce the power needed for data center cooling. For colocation tenants, that means dramatically reduced costs. In locations where it gets too hot and/or too humid, traditional free cooling doesn't work - or it brings cold aisle temperatures to levels that most colocation tenants simply aren't comfortable with. Without conditioning (which can be expensive and reduces the efficiency of the system), outside air can introduce contaminants to the data center and/or make the data center too humid or too dry - all of which can cause an outage. Traditional free cooling systems typically aren't able to meet the cooling needs of high density IT environments. So there are very few (if any) colocation providers leveraging free cooling at all - they still use the old chiller plant/forced air technology. Their customers, then, are trading energy efficiency and lower costs for location flexibility and reliability. 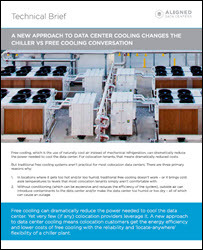 To learn more about the new approach to Data Center cooling download this guide on Chiller vs Free Cooling.